Pantai Hospital Penang is strategically located in the bustling town of Bayan Baru, close to the Penang Bayan Lepas Free Trade Zone, and just a 30-minute drive from Georgetown, Penang. Its close proximity to the Penang International Airport and the Penang Bridge (1st and 2nd link) makes the hospital the preferred healthcare centre for both locals and medical tourists. The 190-bed specialist hospital houses more than 48 resident doctors, 13 sessional and 2 visiting specialist doctors. It provides an extensive list of medical services and specialties, including cardiology, cardiothoracic surgery, neurology, neurosurgery, laparoscopic surgery and orthopaedics, interventional radiology, brachytherapy, and a centre for the treatment of stroke. Pantai Hospital Penang is committed to excellence in healthcare and patient experience. 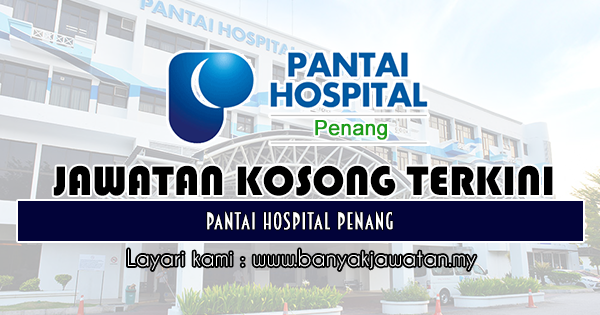 Pantai Hospital Penang is one of 14 hospitals operated by Pantai Holdings Sdn Bhd (Pantai Group), which is part of Parkway Pantai Limited, a subsidiary of IHH Healthcare Berhad (IHH). 0 Response to "Jawatan Kosong di Pantai Hospital Penang - 8 Mei 2019"